After a marathon 8 or so days and 15 flights it was finally time to return back to where I started, Melbourne. I would be there with just ONE MORE FLIGHT. Back in completely familiar territory with a flight I have been on many times before. I think I have covered Thai business class pretty well on this blog so it's a mostly pictorial report just to complete the story. 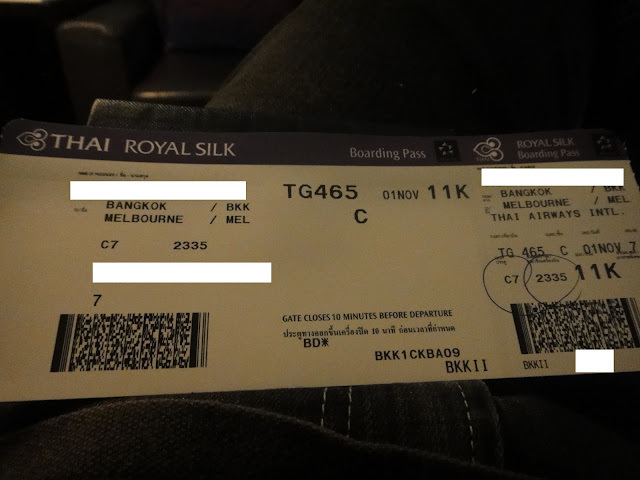 TG465 is Thai's late night departure to Melbourne, Australia operated currently by the Boeing 777-300. The two class aircraft has PTV's for all passengers and Thai's angled lie flat business class seats. Tonight I was flying business class and I would be in the bulkhead window seat 11K. Check-in was completed promptly at the dedicated business class area for Thai passengers at Suvarnabhumi Intl airport. From here I went directly to fast track passport control and security checks, and from there, it was just a few steps and an escalator ride down to the concourse D business class lounge. Entry here is for business class passengers with Star Alliance gold passengers using the concourse C and E lounges. After a short stay in the busy lounge it was time to head to gate C7 for boarding. The seats were prepared with the good quality blankets this time, along with pillow and noise reducing headsets. We departed a few minutes behind schedule, business was about 80% full tonight. I relaxed with a movie and awaited dinner, which commenced soon after we reached our cruise. Lamb - main course. Presentation not the best! Dessert and a cup of tea - Dessert was delicious!!! After dinner I attempted to sleep and managed to get a bit of rest before it was time for breakfast. I can't comment on service experienced during the sleep time as I had my eyes closed sorry! About 90 minutes prior to landing in Melbourne a full breakfast was offered and it was typical Thai Airways fare. Fruit, yoghurt, egg and bakery. It was alright, although I am never a big fan of the 'chicken sausage'. The crew came around with Australian arrival cards and express immigration cards just before descent. Another Thai Airways flight completed and it was as usual, neither outstanding nor disappointing... it's just somewhere in between and exactly what I have come to expect from Thai. It was pleasing to be home after such a long flight and my goal had been achieved... Qantas Platinum status. Within a couple of weeks of arriving my shiny new platinum card had arrived in the mail, thanks American Airlines for the opportunity!